If there is HELLO ! After a ridiculously long break, due to lack of time (damn having to work), I'm trying to figure out how to use typepad again. Ive chucked the job in and am going to have a go at being self employed, wish me luck ! I'll be back soon,, in the meantime I've set up a new page on Facebook and instagram ,just type in mollychicken, I'll post links when I remember how to. I'll be making stuff, selling stuff and providing tutorials, just like before. If you reading this, thank you, you are awesome !!! 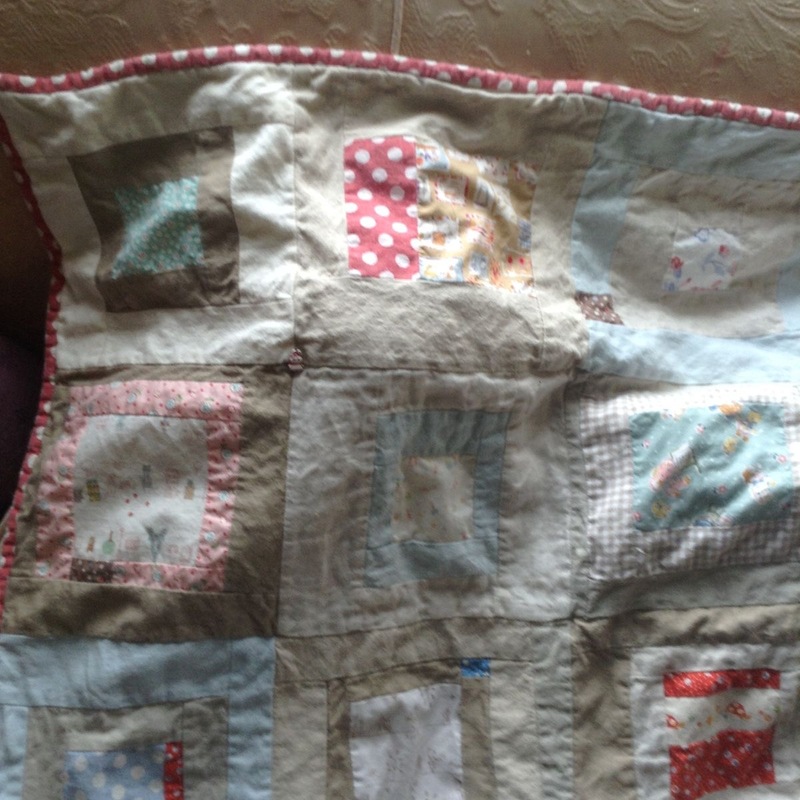 hmmm, not sure if you can see it, if you can, it' a very crappy photo of a quilt I made for my little great niece. More pics when, when I figure out how to do it. Me and Licky have just popped in to say hello and to wish you a Jolly new year. I lost my blogging voice there for a while and I'd like to thank everybody who asked after me and for anybody still checking in on my poor sorry blog. I've had a weird year - will that do as an excuse ? back soon and I've missed you. 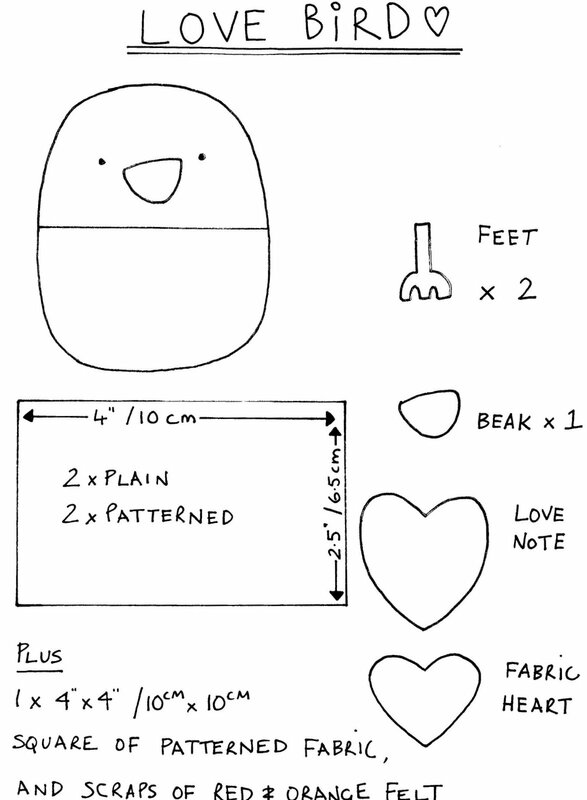 I've changed the dimensions on this tutorial so you can make a bag from half a yard of fabric and lining. The bag I made previously, used half a metre, but I know a lot of you gals out there work in feet and inches so I very thoughtfully thought of you and altered it to only use a half a yard of standard 44" wide fabric. I'm so very kind and lovely like that. I'll just let you take the blame that I haven't tidied up today because I've been obsessed with doing this. O,k, you will need a large piece of paper measuring 26" x18" ( I taped a load of A4 pieces together) fold the paper in half so that it measures 13"x18". Cut away the 4" strips on the left for the base and straps like this. On the right hand side of your main piece, make a little mark 12" up from base. On the left hand side, make a mark 11 and a quarter " up from base, and then scoopity scoop your bag shape something like this. on the right hand side, flatten out the scoop on the bottom edge so it fits in underneath your arm nicely. Keep one of your 4" straps intact for the base, the other, slice in two measuring 18" x "2 for the straps as above. At this point I have to stop and continue early next week, because it's my eldest boy's 21 st birthday tomorrow and I have to make a chocolate cake. Although if you saw me, you would never ever believe I looked old enough to have a son that age - contrary to the opinion of my daughter, who once again says it's embarrassing to have the oldest and quite possibly the fattest Mum in the class - one day I'm going to poke her right in the eye. I'll be back early next week, (tuesday or wednesday I should think) to show how I put the pieces together. Sorry for the delay, but it got sunny here and the kids were on half term hols, so needless to say,there was no crafting for me. cut two straps,1 base and two bag pieces from your main fabric and the same from your lining. Next, using those scooped out pieces between the handles, make the pockets. Lay two pieces right side together, you can put lining with lining and main with main or mix it up if you like - it's up to you. Pin and stitch together leaving a gap for turning. Turn right side out, and stitch gap closed. For a nice clean finish, machine stitch along the top edge or hand stitch as I did later if preferred. Stitch pockets in place about 3" down from the top. Let's hope you make a better job of this than I did, mine looks crap to be honest. Now stitch your straps to the left hand side (as you're looking at it) of the bag pieces like so. For the lining - stitch the straps to the RIGHT HAND SIDE of the bag pieces, DO NOT I repeat DO NOT forget to do this, or things won't match up when you go to sew them together and you will have a lot of unpicking to do. I'm stressing this point , because I'll give you one guess as to who may or may not have made that very mistake first time around. Stitch the base to your bag pieces and repeat for the lining. Place one of your lining and main fabric pieces right sides together, and pin and stitch all along the top of the bag and straps. Repeat. Now here's the fiddly bit, turn the strap and strap base right side out, and tuck into the pocket so you don't nearly stitch over them later. Cough cough. Next, with right side together, matching up the seams, pin and stitch your bag together leaving a 4" gap for turning on one side of the lining as shown below. It should look something like this. trim excess, turn right side out and stitch lining gap closed. Ladder stitch the free end of the strap to the bag. and hand stitch across the top of the pockets if you didn't machine stitch earlier. Just for a bit of fluffy girliness, I then cut some simple flower shapes from the scraps, made little slits in the middle to thread through some linen tape, knotted the linen tape at the front, did a few anchoring stitches at the back, and then stitched the tape to the pocket. Just about the right size for a picnic blanket, some strawberries and a bottle of Champagne. There are probably easier ways of doing this (there normally are when I do something) but I hope this makes sense to you. We put some blue linen backed with white cotton onto an embroidery frame. We drew around the bunnies. Laid our bunnies face down onto scraps of wool felt, and then stitched together on top of our other stitch line. Cut off the excess and snipped those curves. Carefully cut a line in the felt (with Mummy trying desperately not to interfere here), and then turned the right way out. Stuffed them, stitched closed and then added a brooch pin. Then Molly pinned them to her bag. My poor neglected blog. I've not been doing anything exciting, in fact that's the first bit of stitching I've done in weeks and weeks. Instead I've been spring cleaning - bleughh. If you got caught in a big dust cloud hanging over the south-west of England last week - that would have been me - cleaning my kitchen cupboards. Anyway I shall be back after Easter posting a more regular basis now that my house is sparkling (ish). I hope you have a lovely break with lots and lots of chocolate and sweeties. Firstly,you have two stitch through three layers of fabric - one a very stiff cotton, one a very thick blanket, and all the while your sewing machine is protesting loudly and needle-breakingly. Secondly, you then realise that you have to hand quilt the three layers of fabric together because the bloody thing still keeps sagging. Thirdly, you have to hand stitch a sodding zip to it. And you all know how I feel about zips. Can you tell Puppy was terrified by my swearing whilst making this project ? Never mind, it's done now, and this was made at the special request of my little nephew Harvey who is quite certain that I can stitch anything in the world . Happy Birthday Harve ! I'm sure there must be a much easier way of making something like this, but if there's an arse-about-way of doing things - then I'm your girl. I think I can safely say this is on my list of things I'm never going to make again, and thinking about it, I'd love to hear what you will never ever be attempting again. (Unless you are emotionally blackmailed by a sweet 5 yr old of course). Have a happy weekend all !